Just a pic with most of my favorite heroes from all genres. There are some things that I really liked about this piece, especially how Optimus Prime, Iron Man and Captain America look. My main complaint is that I idiotically placed Green Lantern and the Hulk too close together and the green kinda causes them to 'melt together' visually. That's the 'Smart Hulk' version of Bruce Banner because Peter David's run on the book is the ONLY reason that he's in the pic. Another little known fact: the Spider-Man in the picture is a cutout that can be slid into a cut in the picture. I also have a regular-costume Spider-Man that can be put there, but I never got a copy of the pic with that Spidey there. 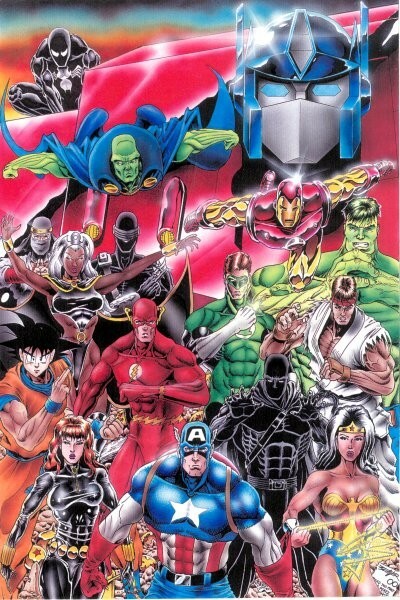 In the picture are: Spider-Man, Optimus Prime, J'onn J'onzz/Martian Manhunter, Iron Man, Jo 'Shinobi' Musashi, Storm, Snake-Eyes, Green Lantern, Hulk, Ryu, Goku, Flash, Black Panther, Black Widow, Captain America, and Wonder Woman. Since this was rushed, this really doesn't reflect my favorites 100%. There'll be better representation in the 2007 version I have planned.